Vines have a bad rap. Invasive non-native vines like Kudzu, Oriental Bittersweet, Japanese Honeysuckle, Porcelain Berry, and English Ivy grow up and over trees, often smothering whole forest edges. By making them top-heavy, these vines can damage and pull down entire trees. However, not all vines are bad actors. Most locally native vines are attractive and well-behaved. By providing food, shelter, and nesting places, they add high wildlife value to our habitat gardens. I have three of these natives and I highly value the roles they play in my garden. 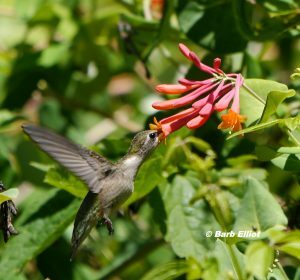 A female Ruby-throated Hummingbird visits Barb’s Trumpet Honeysuckle. © Barb Elliot. Click to enlarge. With Trumpet (aka Coral) Honeysuckle in your yard, Ruby-throated Hummingbirds will visit – guaranteed! This native honeysuckle is not at all like its unruly cousin, Japanese Honeysuckle. Handsome and well-behaved, this vine sports blue-green foliage and coral-red trumpet-shaped flowers. It’s easy to grow in average, well-drained soils with medium moisture. 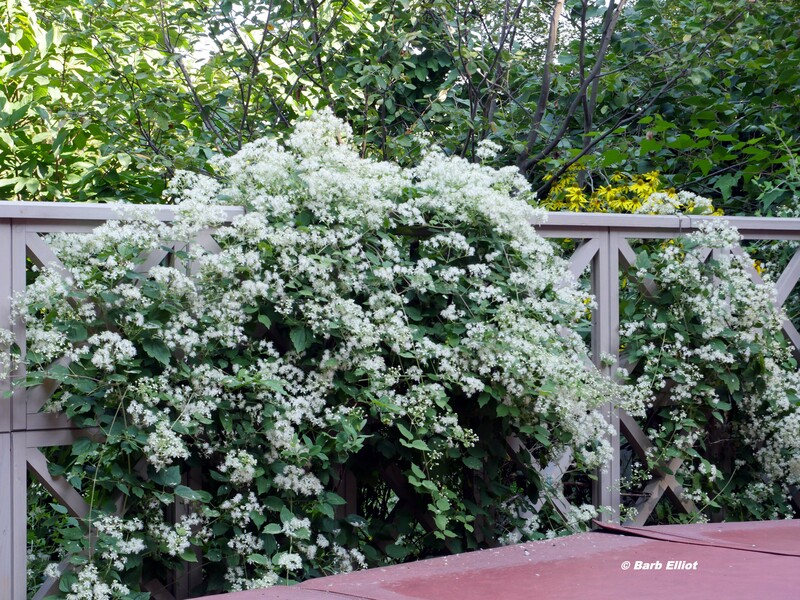 A twining 10-15’ vine that needs a support, it is striking on a fence or trellis with its profusion of flowers. It grows in shade, but flowers best in full sun. Trumpet Honeysuckle begins blooming in April or May and blooms intermittently through summer and into the fall. In autumn, birds eat the red berries. Trumpet Honeysuckle alongside Barb’s deck. May 18, 2018. © Barb Elliot. Click to enlarge. Trumpet Honeysuckle provides food, shelter, and nesting locations. One year, American Robins built a nest in one of my honeysuckle vines. A vine growing close to my bird feeders provides shelter for birds escaping hawks and other predators. According to Doug Tallamy, this honeysuckle hosts up to 33 species of butterfly and/or moth caterpillars that eat its leaves. Among them are two day-flying hummingbird look-alike moths. the Hummingbird Clearwing and Snowberry Clearwing. The beautiful trumpet-like flowers of Trumpet Honeysuckle, showing their yellow inner parts. © Barb Elliot. Click to enlarge. 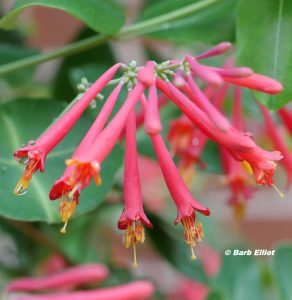 Trumpet Honeysuckle is truly beloved by hummingbirds. I love to sit on my deck and watch these flying jewels sip nectar from the long tubular flowers and even fight over the blossoms. George Washington grew this vine at his Mount Vernon estate where it is still grown today. In a 1785 diary entry, Washington described planting it around columns and along walls. Perhaps he, too, enjoyed the hummingbirds that visited his Trumpet Honeysuckle. The handsome leaves of Virigina Creeper with their 5 leaflets each. 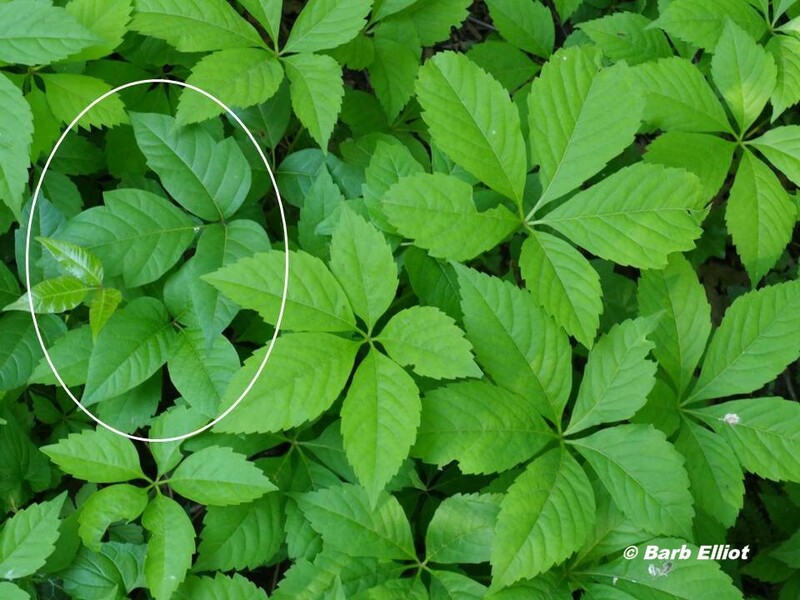 Poison Ivy, circled on left, with its 3 leaflets per leaf. © Barb Elliot. Click to enlarge. Virginia Creeper, not to be confused with Poison Ivy, is a beneficial vine that’s entirely harmless to humans. To differentiate the two plants, look at the leaves. Poison Ivy always has 3 leaflets per leaf, but Virginia Creeper has 5 leaflets. Some young Virginia Creeper vines may have a few leaves with just 3 leaflets, but most leaves will have 5 leaflets. The green leaves are handsome and in full sun turn bright red or purple in October. A Virginia Creeper Sphinx moth caterpillar Barb found on her vine. 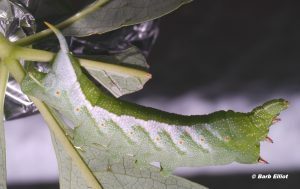 Note the pointed “horn”, or tail, on left hind end – typical of caterpillars in the sphinx moth family. © Barb Elliot. Click to enlarge. Offering high wildlife value, Virginia Creeper hosts 32 species of caterpillars, including the striking Pandora Sphinx and Abbott’s Sphinx moth caterpillars. These are my most sought after caterpillars, but I have yet to find either of them. However, as a consolation, I’ve discovered several Virginia Creeper Sphinx moth caterpillars, which I raised to become beautiful adult moths. 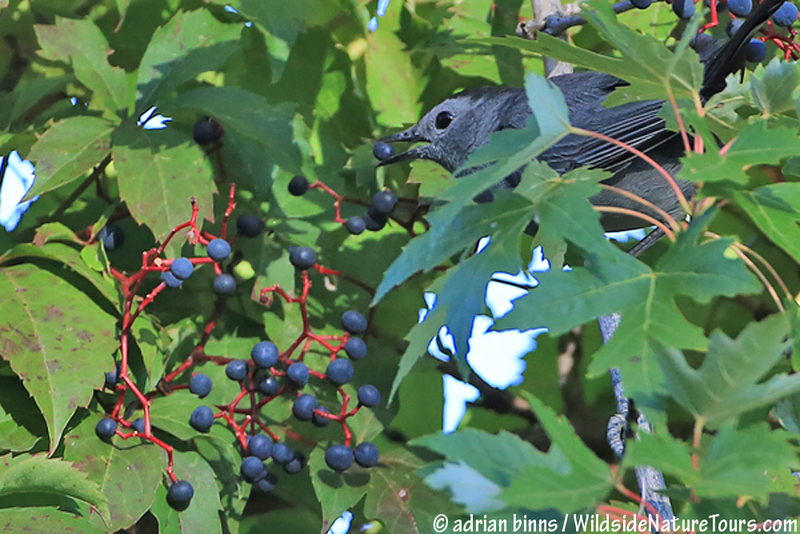 A Gray Catbird eating Virginia Creeper berries. Note the berries’ red stems. Photo courtesy of and © Adrian Binns/WildlsideNatureTours.com. Click to enlarge. In spring, the wildlife-friendly Virginia Creeper’s inconspicuous flowers attract bees and other small pollinators. Thirty species of birds, including chickadees, woodpeckers, robins, catbirds, warblers, and bluebirdsrelish the dark blue berries in autumn. Reddish fall foliage and the bright red stems of the berries lure the birds. Small animals use this vine for cover, especially when it grows along the ground. A few years ago, Northern Cardinals built a nest in the Virginia Creeper growing on my arbor. A deciduous woody vine, Virginia Creeper is easy to grow in full sun to full shade in well-drained soil with average moisture. It will climb brick or stone walls, trellises, arbors, fences, or large trees. One of my favorite ground covers, it will happily cover a stump or wood pile. Although a vigorous grower, climbing 30’ feet or more, it will not smother trees. If it becomes unruly, it can easily be pulled down or cut off at the base where it will re-sprout. 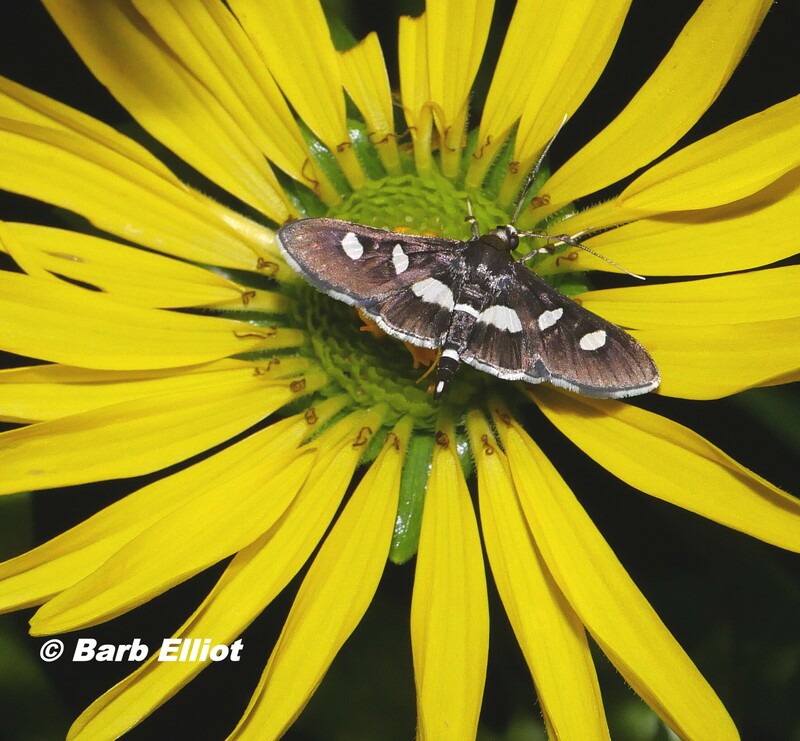 An Ailanthus Moth visiting Barb’s Virgin’s Bower. These moths visit both during the day and night. © Barb Elliot. Click to enlarge. Virgin’s Bower, a native clematis, is a superb plant for pollinators. Its small white flowers have a pleasing, sweet fragrance and cover the foliage from mid-to late-August into September. The flowers attract many pollinators, including butterflies, bumble and other native bees, plus interesting wasps and flies. Intent on collecting nectar and pollen from the flowers, they are usually oblivious to my presence. Virgin’s Bower blooming alongside Barb’s deck. © Barb Elliot. Click to enlarge. Predators like spiders and centipedes furtively wait to catchthe unsuspecting pollinators. I have spent hours, both day and night, watching the pollinators and dramas of nature play out on Virgin’s Bower. A nighttime visitor to Virgin’s Bower, Tobacco Budworm Heliothis virescen. © Barb Elliot. Click to enlarge. mass. The vines can take root where they touch the ground. Seeds from its attractive seed heads are windblown, so new plants can pop up elsewhere in your yard. But if you are diligent and keep this vine in check, you and many pollinators will be well-rewarded by your efforts. Red=spotted Purple butterfly at Barb’s Virgin’s Bower. © Barb Elliot. Click to enlarge. Now is a good time to add these vines to your landscape. 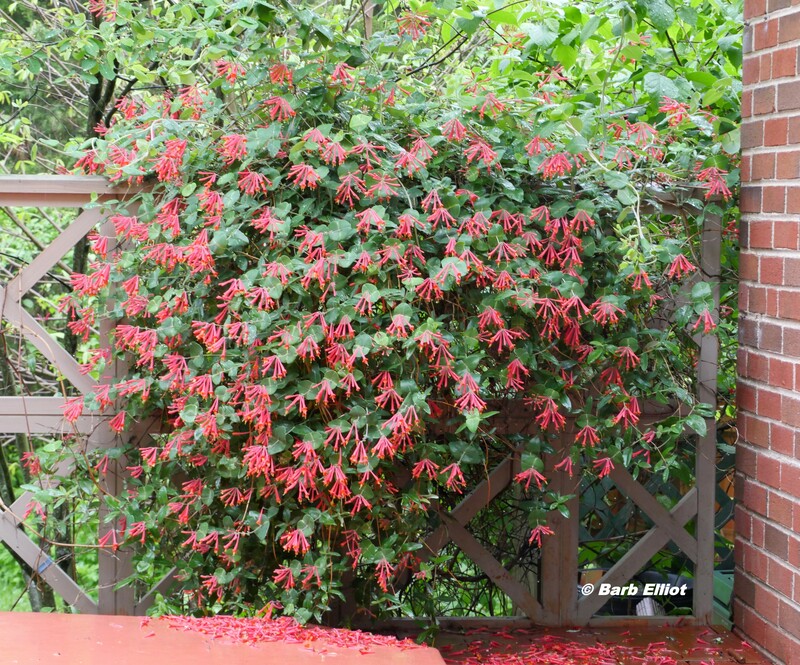 If you have a small space, Trumpet Honeysuckle will work well. 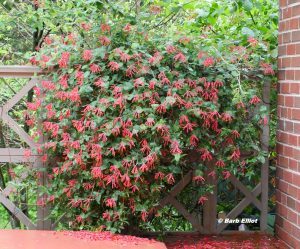 For larger areas, try Virginia Creeper or Virgin’s Bower. These vines will add texture and interest to your landscape. 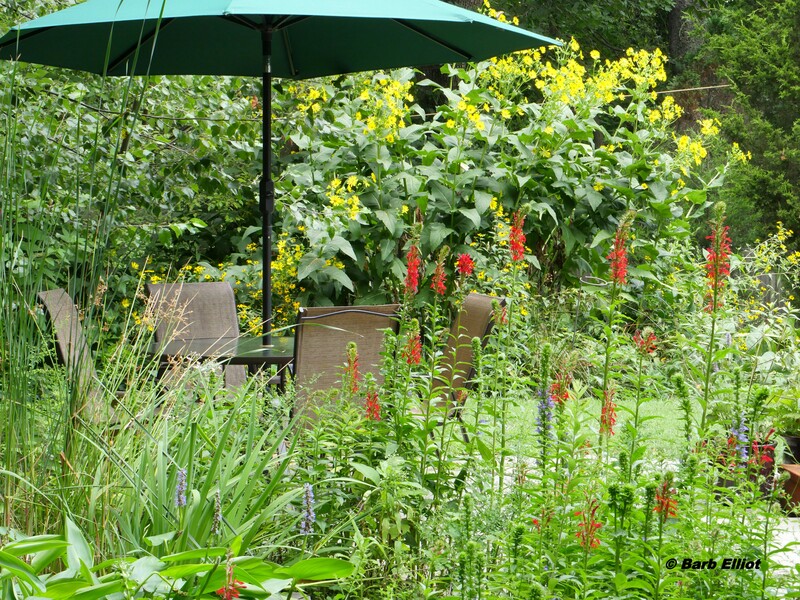 Pollinators, birds and other wildlife will thrive in your garden. When I leave my house to explore my backyard, whether by day or after dark, I enter another world. Transported from daily cares, I anticipate experiencing the wonders of nature. What’s happening at this season? What creatures will I encounter? What mysteries will unfold? I am rarely disappointed. Life is abundant in my yard because the numerous native plants I’ve planted meet the food and shelter needs of many animals. This summer I photographed some of what I observed. Here are highlights. Enlarge any photo by clicking on it. 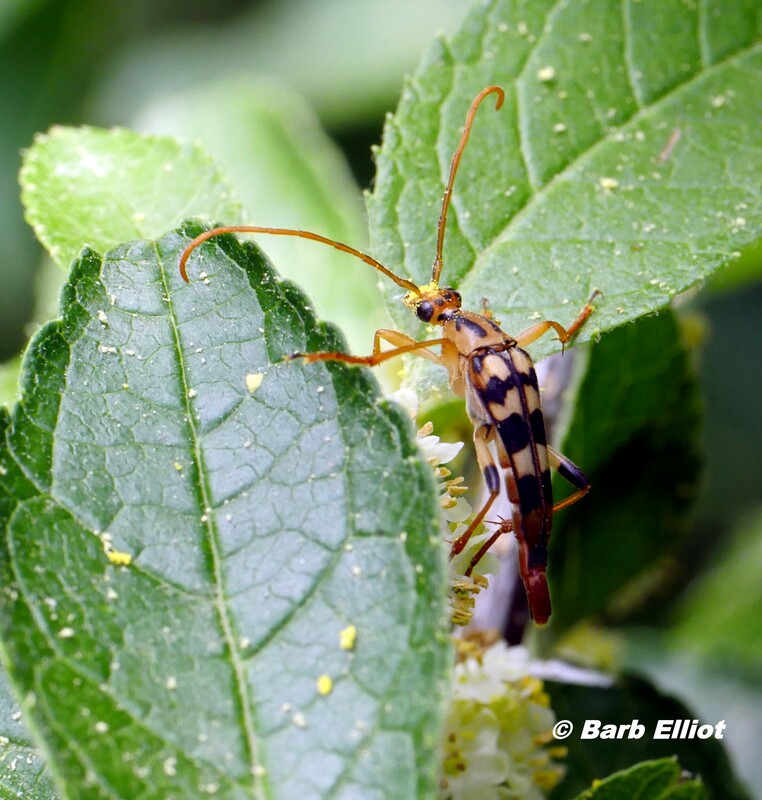 Interesting pollinators gather nectar and/or pollen from my Highbush Blueberry flowers, including a Flower Longhorn Beetle and an unknown flower fly – a good Yellow Jacket wasp mimic. 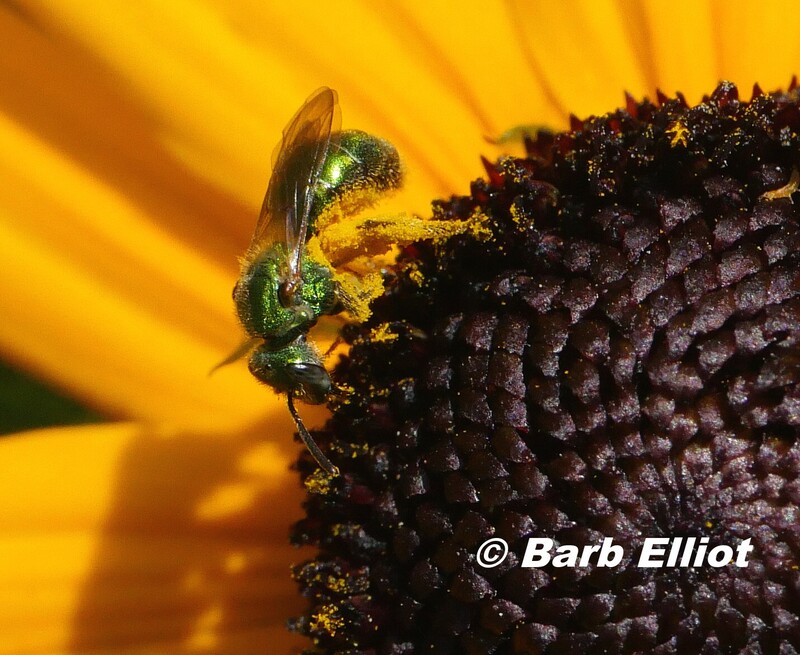 A native Green Sweat Bee on a Black-eyed Susan is covered with yellow pollen grains. 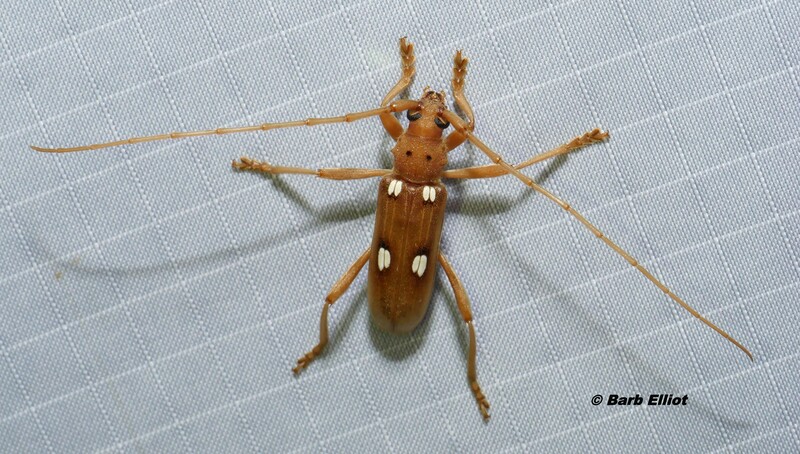 Flower Longhorn Beetle (Strangalia luteicornis) . Photo © Barb Elliot. Click to enlarge. Unknown flower fly. Photo © Barb Elliot. Click to enlarge. Green sweat bee on Black-eyed Susan (Rudbeckia fulgida). © Barb Elliot. Click to enlarge. 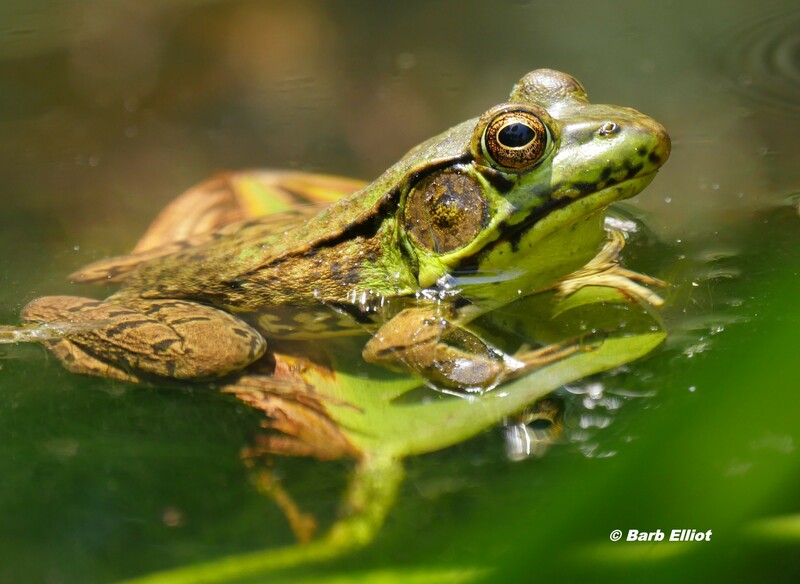 In my pond, a Northern Green Frog awaits its next meal. Near the pond edge an Orchard Orbweaver spider is ready to pounce on prey caught in its web. Northern Green Frog (Lithobates clamitans). © Barb Elliot. Click to enlarge. 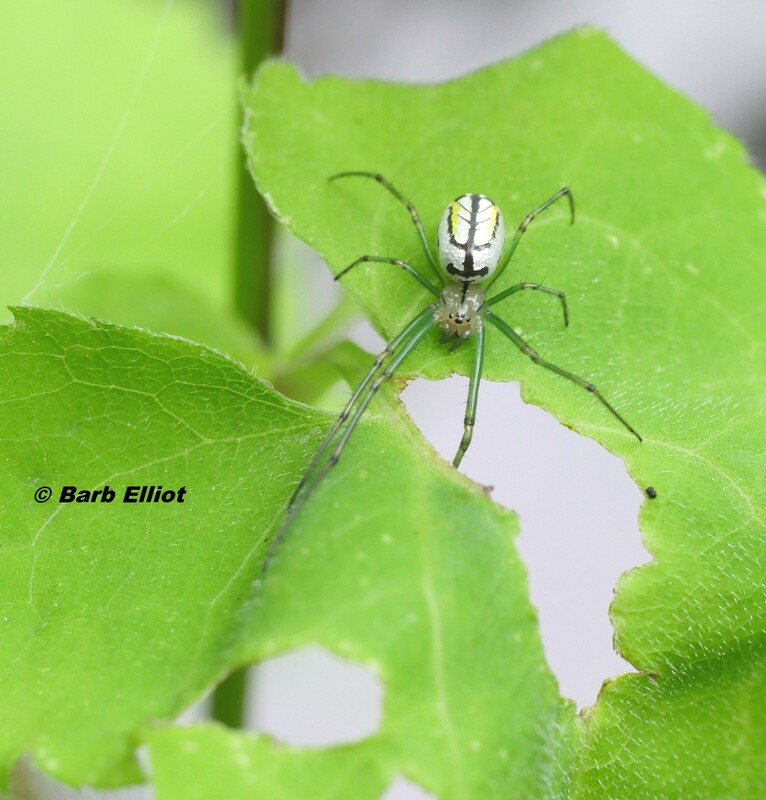 Orchard Orbweaver (Leucauge venusta) spider . © Barb Elliot. Click to enlarge. A Cooper’s Hawk, unsuccessful at catching a songbird, watches for birds to return but eventually leaves without a meal. 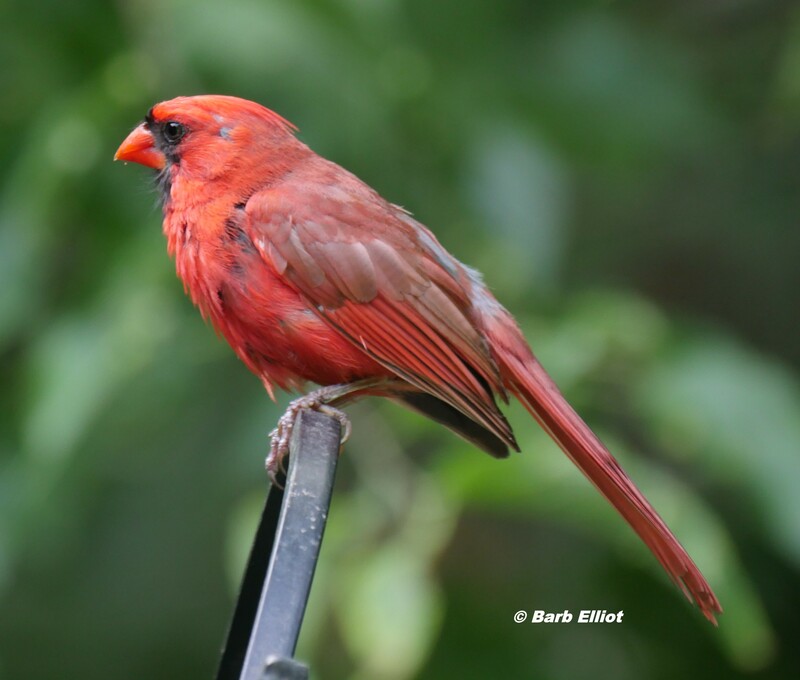 A male Northern Cardinal, which is starting to molt, returns warily to the feeders. 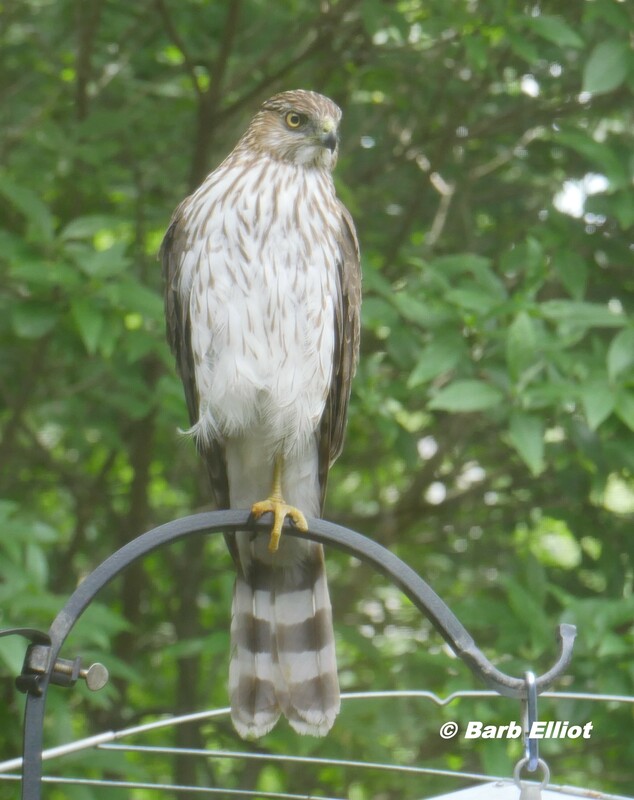 Cooper’s Hawk (Accipiter cooperii). © Barb Elliot. Click to enlarge. Northern Cardinal (Cardinalis cardinalis). © Barb Elliot. Click to enlarge. 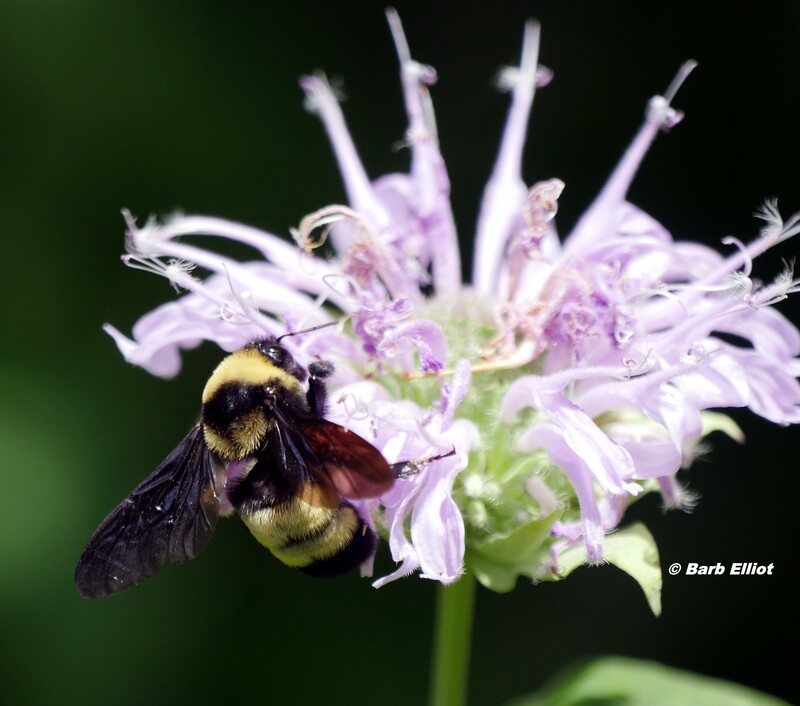 Wild Bergamot flowers attract a day-flying Hummingbird Clearwing Moth as well as many bumble bees. 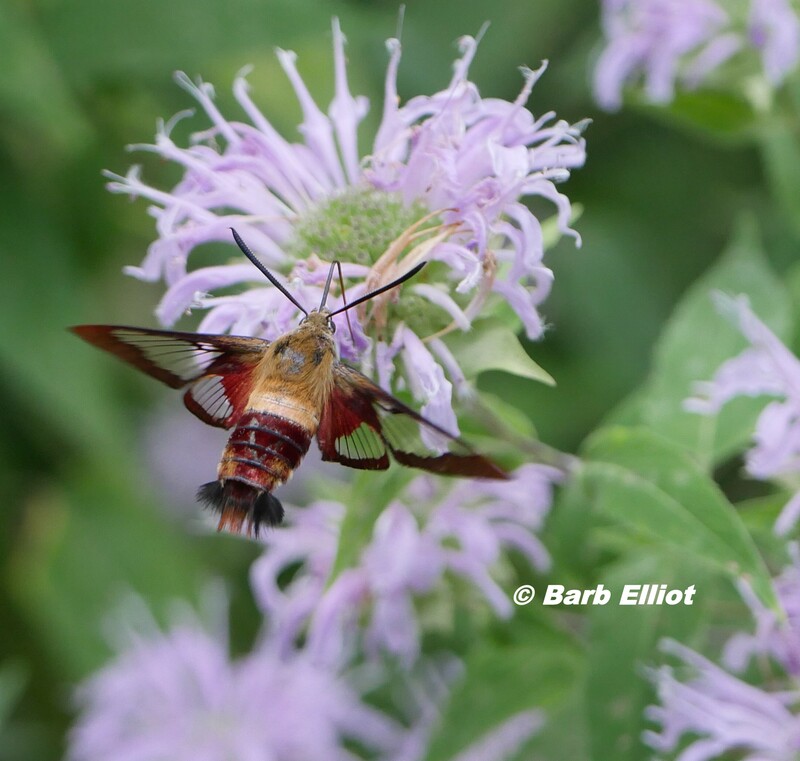 Hummingbird Clearwing Moth (Hemaris thysbe) sips nectar from Wild Bergamot (Monarda fistulosa). © Barb Elliot. Click to enlarge. Unknown bumble bee on Wild Bergamot (Monarda fistulosa). © Barb Elliot. Click to enlarge. One night, I find mating Red Milkweed Beetles on a milkweed plant and a Virginia Creeper Sphinx moth caterpillar on a Virginia Creeper vine. On another night, an adult Virginia Creeper Sphinx moth comes to my lights. 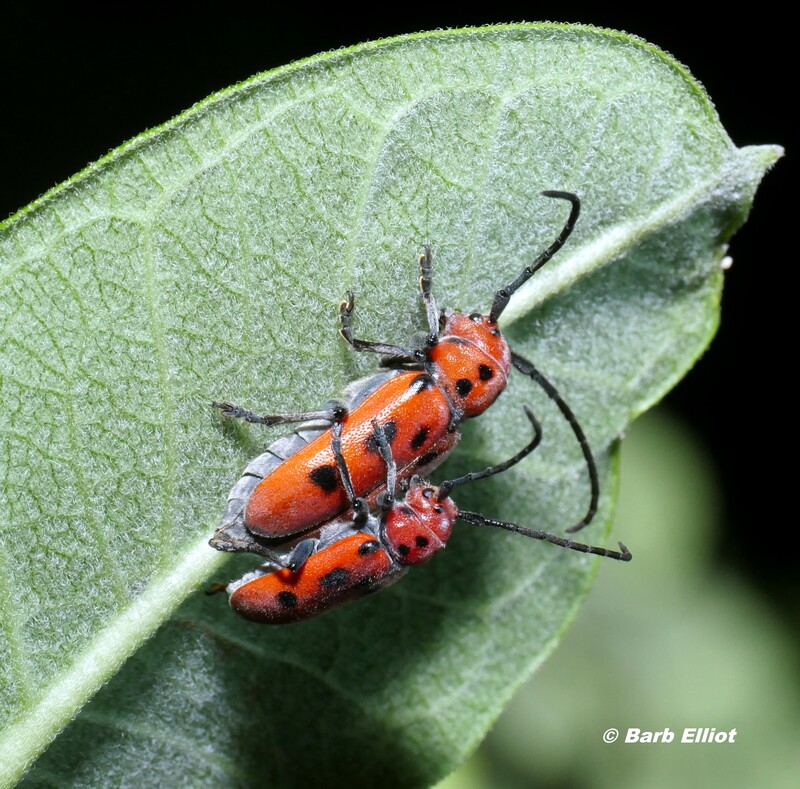 Red Milkweed Beetles (Tetraopes tetrophthalmus) mating. © Barb Elliot. Click to enlarge. Virginia Creeper Sphinx Moth (Darapsa myron) caterpillar. © Barb Elliot. Click to enlarge. 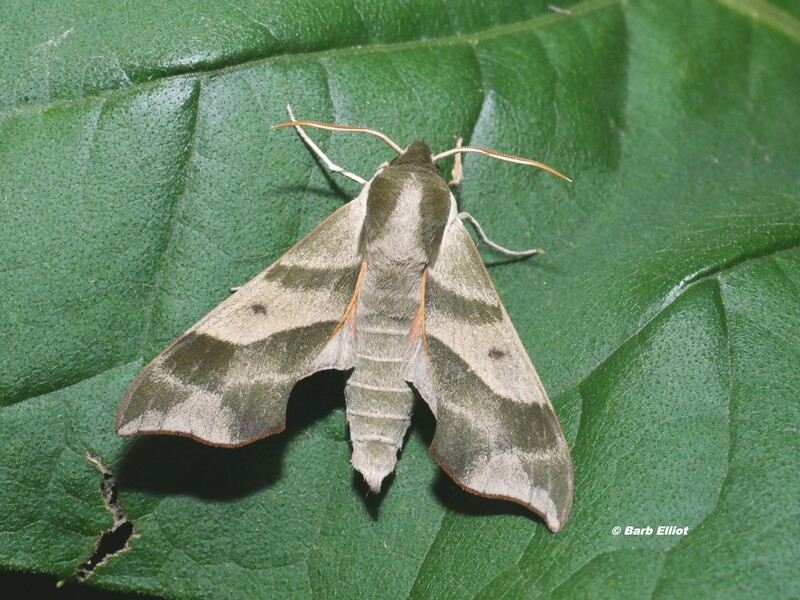 Virginia Creeper Sphinx moth (Darapsa myron). © Barb Elliot. Click to enlarge. A Tent Caterpillar Moth, which I find attractive, also flies in. 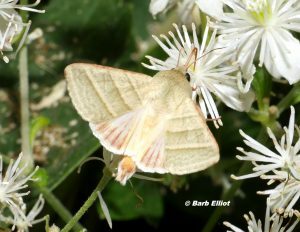 Yes — this is the adult moth that comes from the Tent Caterpillars that make webs in my Black Cherry (Prunus serotina) trees. 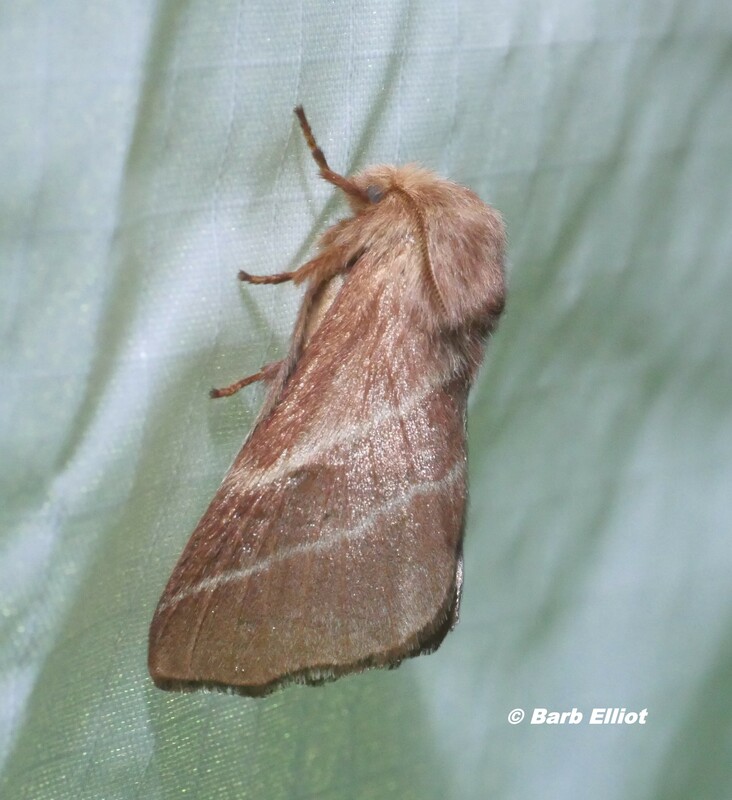 Eastern Tent Caterpillar Moth (Malacosoma americana). © Barb Elliot. Click to enlarge. In July, I find a variety of beetles. My favorite, the Dogbane Beetle, is on a Dogbane plant. A tiny (less than 1/4 inch) colorful beetle, the Mottled Tortoise Beetle appears during the day (wearing its little translucent skirt!). A longhorn Ivory-marked Beetle, comes to night lighting. 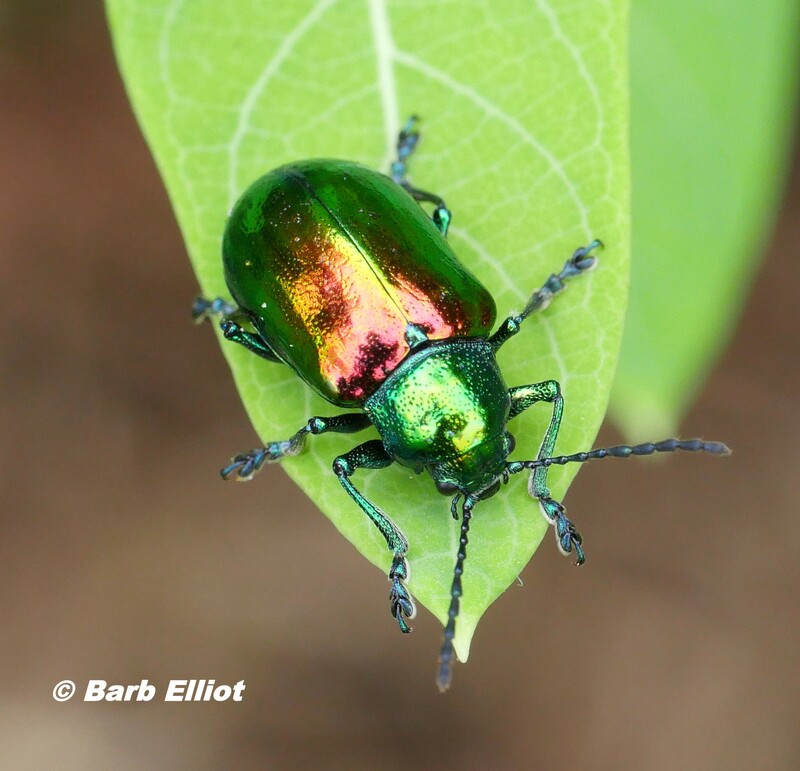 Dogbane Beetle (Chrysochus auratus) on Dogbane plant (Apocynum cannabinum). © Barb Elliot. Click to enlarge. 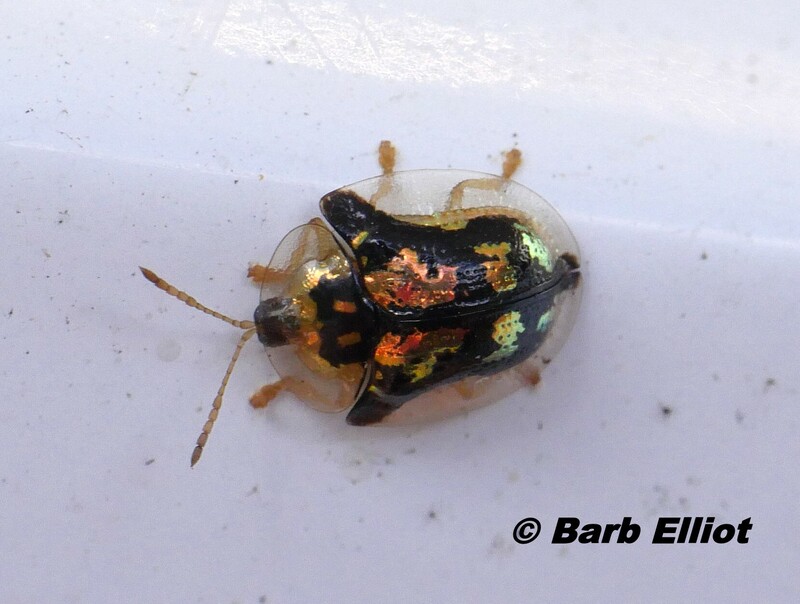 Mottled Tortoise Beetle (Deloyala guttata). © Barb Elliot. Click to enlarge. Ivory-marked Beetle (Eburia quadrigeminata). © Barb Elliot. Click to enlarge. The right side of the patio area sports both Cardinal Flower and Great Blue Lobelia . Pickerel Rush grows in the pond on the left. The tall plants with yellow flowers in the background are Cup Plant. 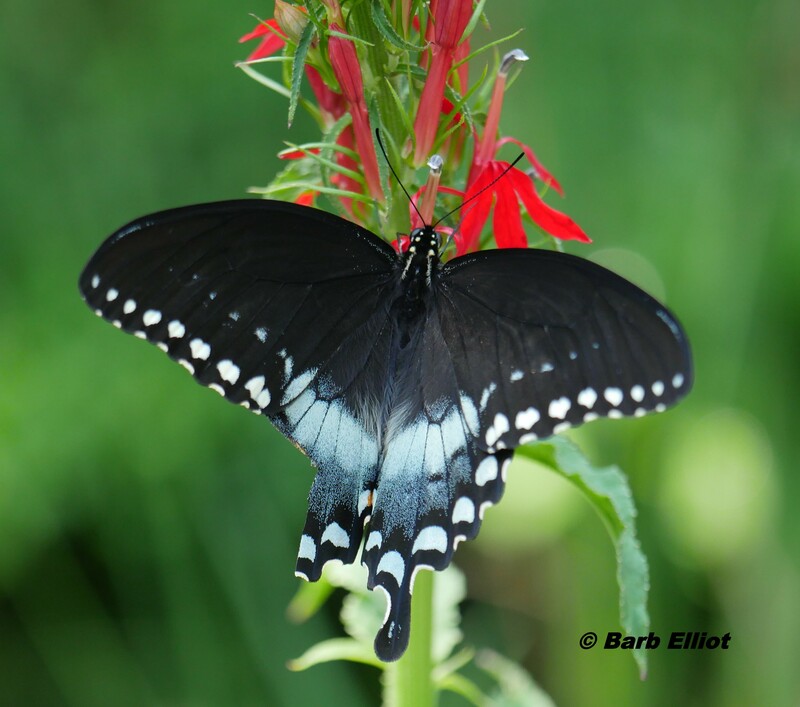 Cardinal Flower nectar is enjoyed by a Spicebush Swallowtail that lost part of its left hindwing. Probably a hungry bird tried unsuccessfully to capture this butterfly. Cardinal Flower (Lobelia cardinalis) and Great Blue Lobelia (Lobelia siphilitica) on right, blue Pickerel Rush (Pontederia cordata) flowers in pond on left. Yellow flowers of the tall Cup Plant (Silphium perfoliatum) in background. © Barb Elliot. Click to enlarge. Spicebush Swallowtail (Papilio troilus) missing part of left hindwing on Cardinal Flower (Lobelia cardinalis). © Barb Elliot. Click to enlarge. Cup Plant attracts many pollinators, including bees, butterflies, and moths. At night I find a Grape Leaffolder Moth sipping nectar. One of many bumble bees that worked hard gathering nectar and pollen during the day sleeps on a Cup Plant flower. At night, I often find bumble bees sound asleep on flowers in my garden. Grape Leaffolder Moth (Desmia funeralis) on Cup Plant at night. (Silphium perfoliatum). © Barb Elliot. Click to enlarge. Bumble bee sleeping on Cup Plant (Silphium perfoliatum) at night. © Barb Elliot. Click to enlarge. After raising one successful brood, the House Wrens have a second set of nestlings that will soon leave the nest box. 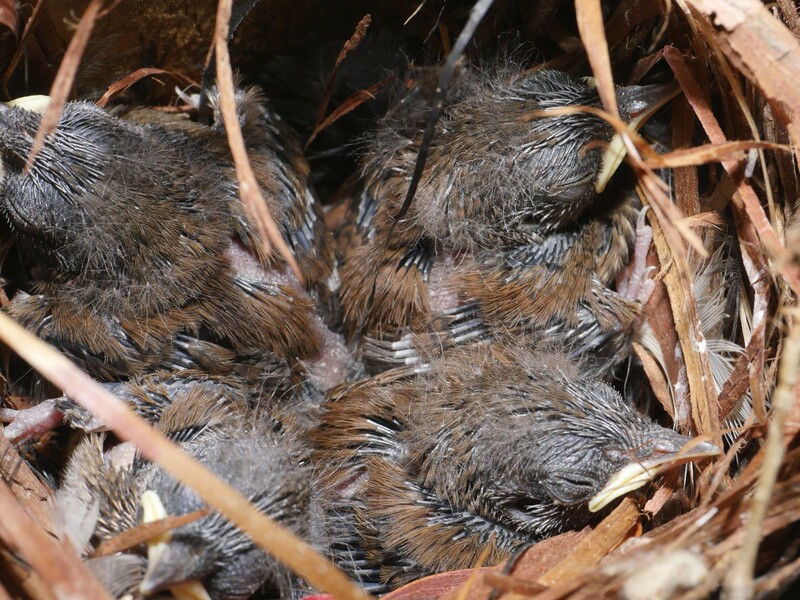 House Wren (Troglodytes aedon) nestlings in nest box. © Barb Elliot. Click to enlarge. 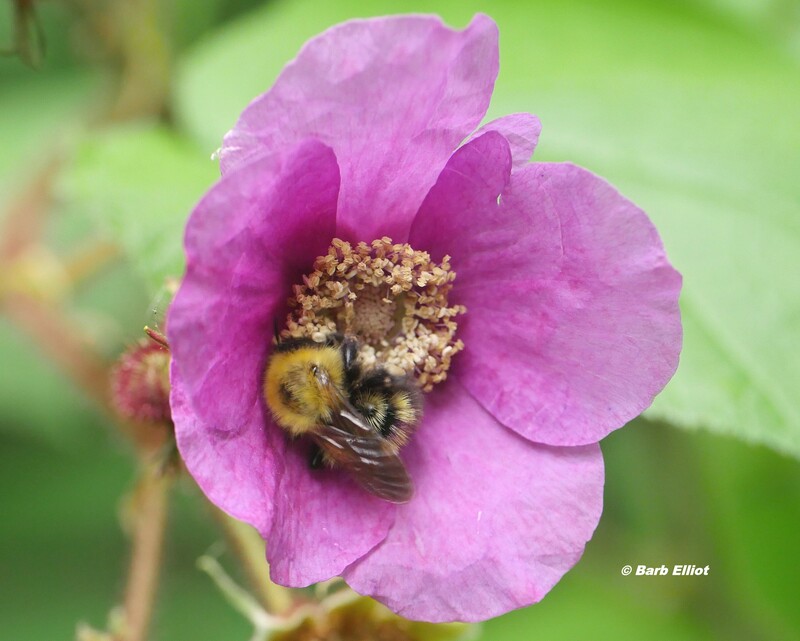 Bumble Bee on Flowering Raspberry (Rubus odorata). © Barb Elliot. Click to enlarge. Several types of native bees are busy pollinating my flowers. 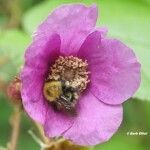 Of special interest, bumble bees are performing buzz pollination on my Flowering Raspberry flowers. Bumble bees vibrate their wings at specific frequencies to get some species of flowers to release their pollen. Note that bumble bees are used for buzz pollination of a number of crops, including tomatoes, blueberries, eggplants, and cranberries. The non-native honeybee is not able to buzz pollinate. 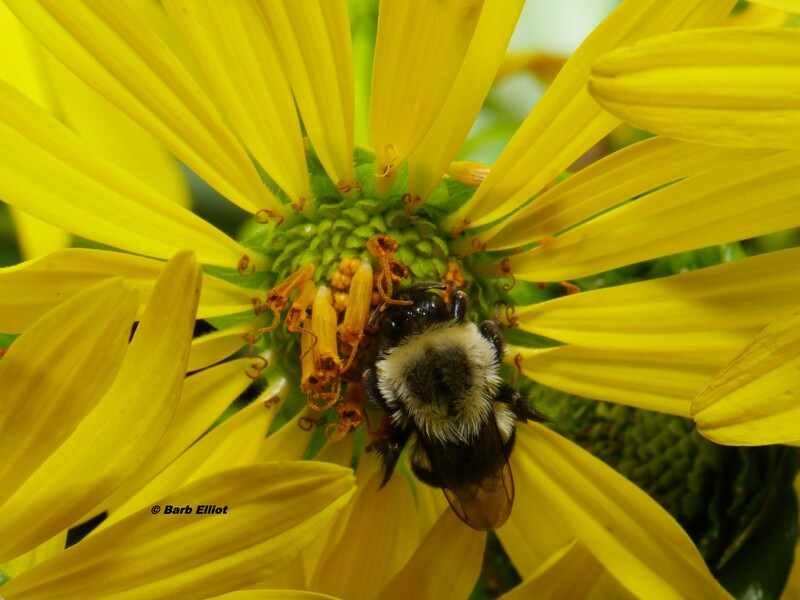 To watch and hear bumble bees performing buzz pollination in my yard, click here for the video. 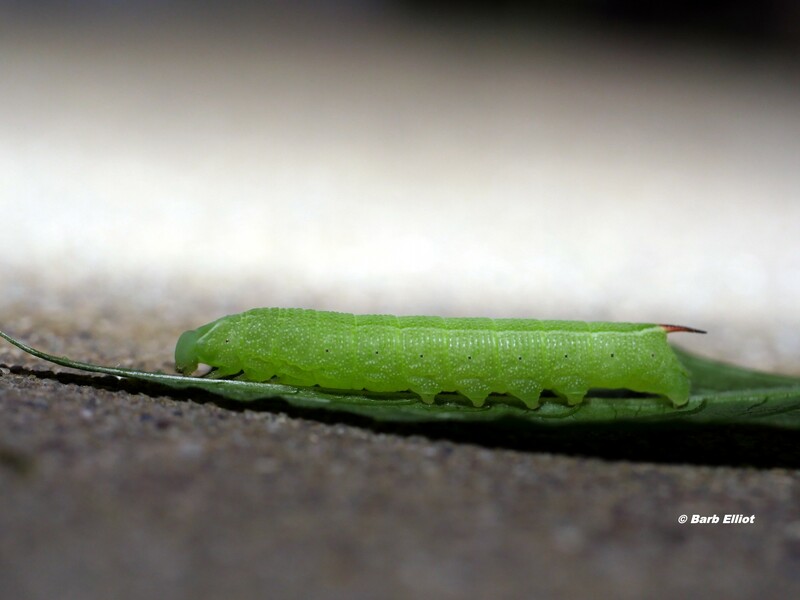 I find a small green Nessus Sphinx moth caterpillar on native Enchanted Nightshade (Circaea lutetiana) and decide to raise it in a small enclosure with several inches of loose soil. 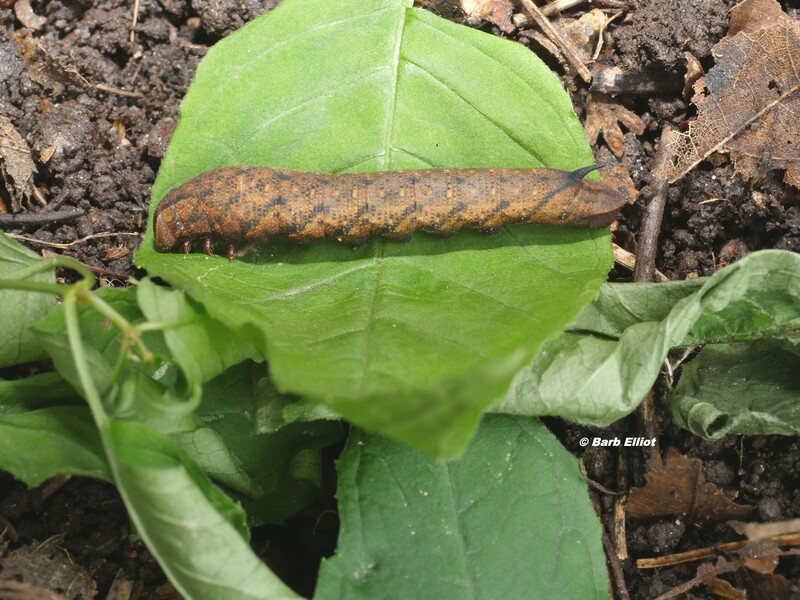 I feed it fresh leaves and within a week or so, it grows to over two inches long, molts into a brown caterpillar, and later burrows into the soil to pupate. I have to wait until next spring to see it emerge as a beautiful day-flying hummingbird-like moth. 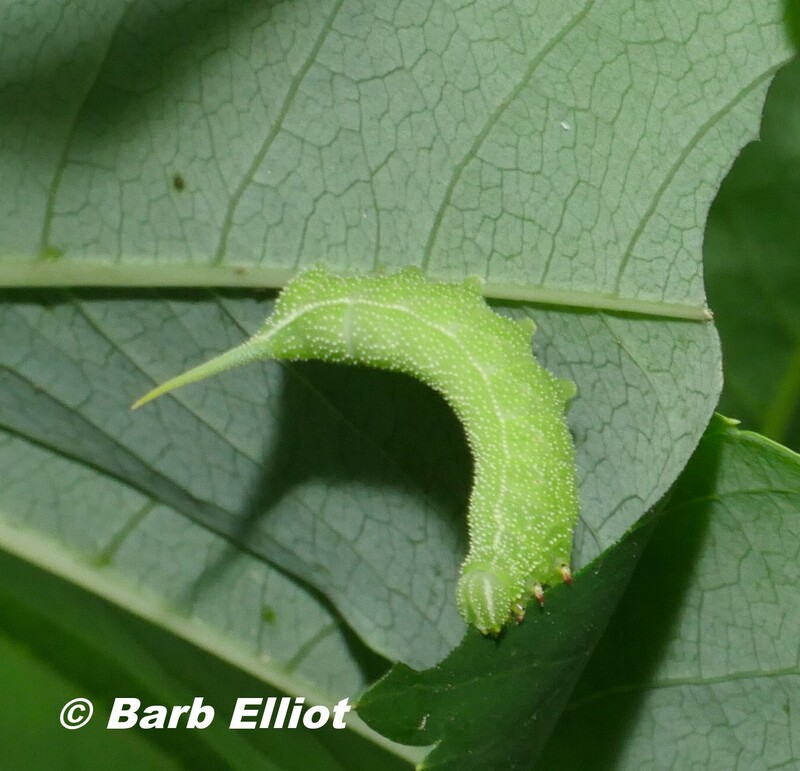 Nessus Sphinx Moth (Amphion floridensis) caterpillar – early instar. © Barb Elliot. Click to enlarge. 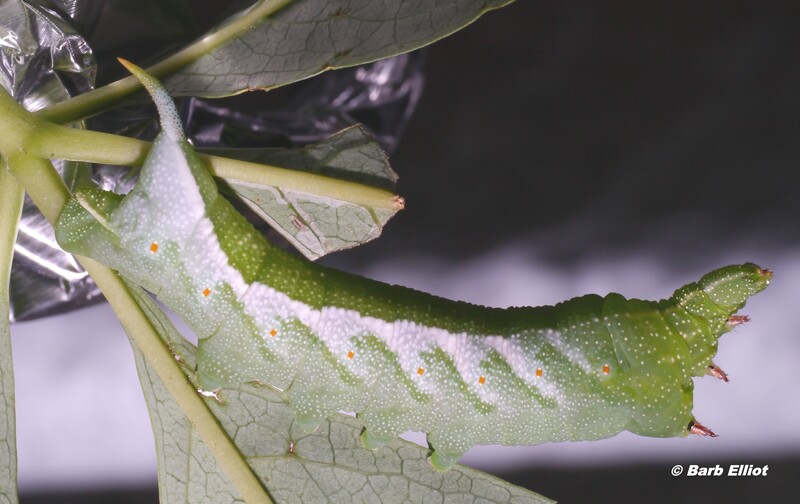 Nessus Sphinx Moth (Amphion floridensis) caterpillar – last instar before pupation. © Barb Elliot. Click to enlarge. One night a strange-looking treehopper, possibly a Buffalo Treehopper, appears near my porch light. Even more strange and ominous-looking, a very large robber fly the size of a large wasp hunts from a perch above my pond. These flies prey on large insects such as bees and wasps and will hang from one foot while devouring a victim. 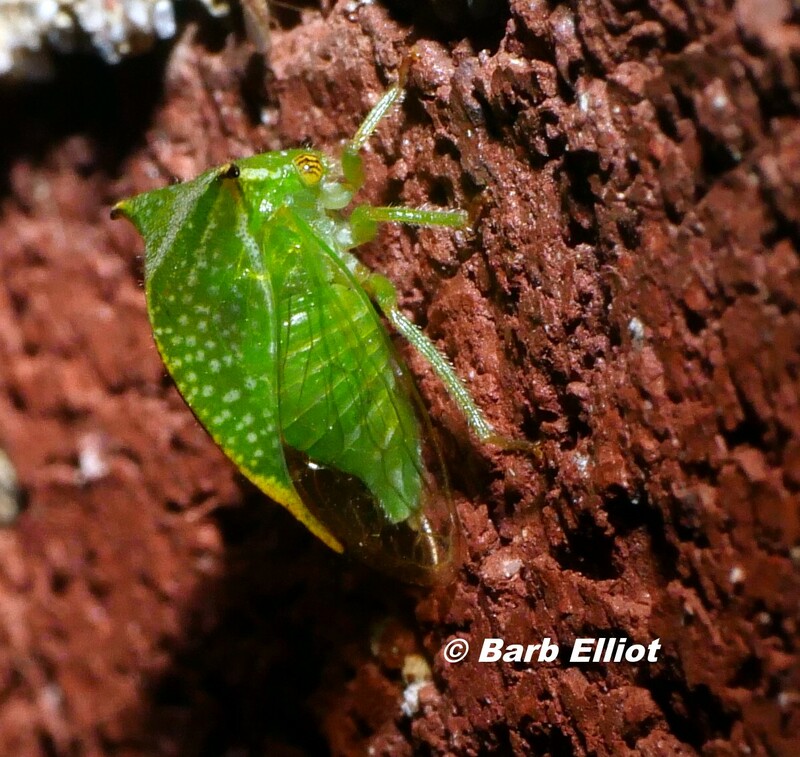 Possible Buffalo Treehopper (Ceresa alta) . © Barb Elliot. Click to enlarge. 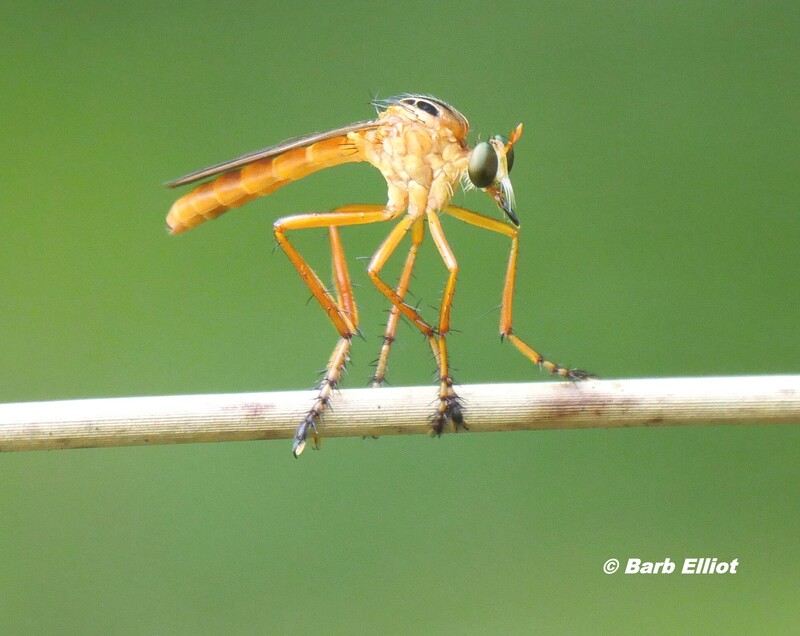 Robber Fly (likely Diogmites sp.) hunts over the pond. © Barb Elliot. Click to enlarge. A Shadow Darner dragonfly dries and expands its wings after emerging from the pond where it spent its nymphal stage. The nymph recently crawled out of the pond and shed its exoskeleton. 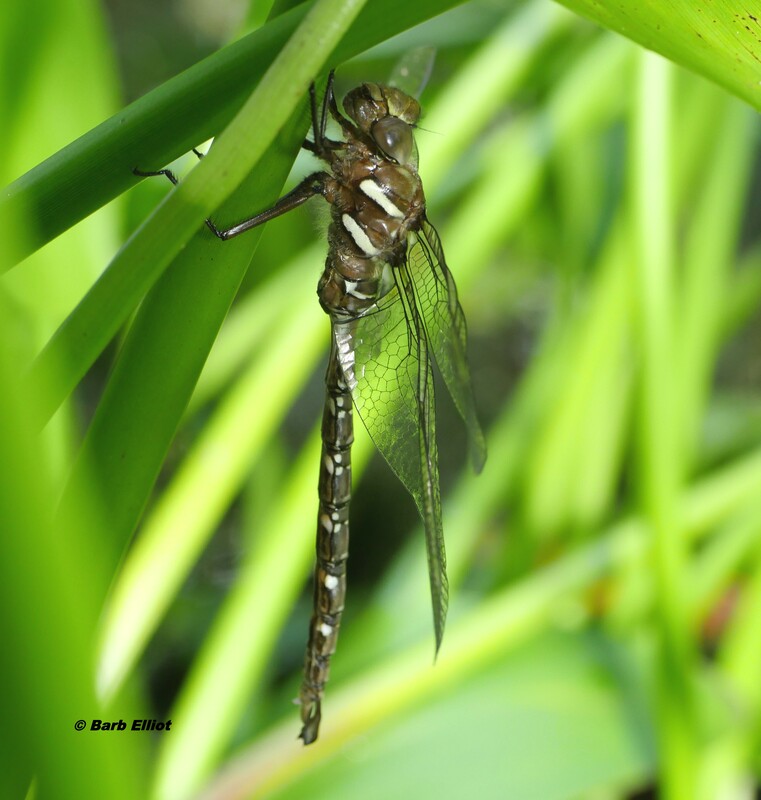 Because I find numerous shed skins (exuvia) during the summer, I know that my pond produces a good number of dragonflies. Newly emerged Shadow Darner (Aeshna umbrosa) dragonfly dries and expands its wings. © Barb Elliot. Click to enlarge. 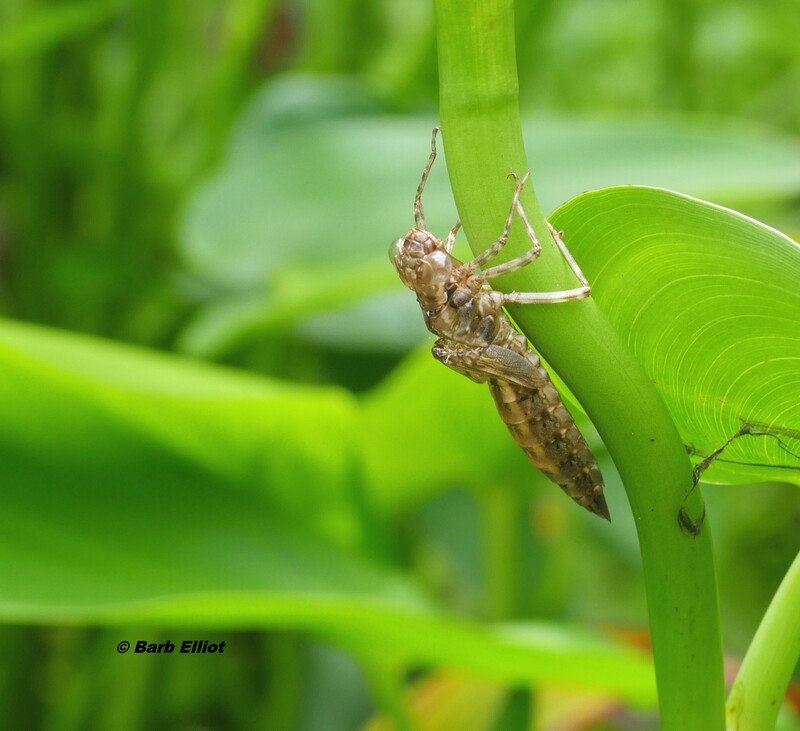 The shed skin (exuvia) from which a dragonfly emerged still hangs from a stem in the pond. © Barb Elliot. Click to enlarge. Native bees continue to actively collect pollen. This one deposits the white pollen of Upland Ironweed into large pollen baskets on its hind legs. 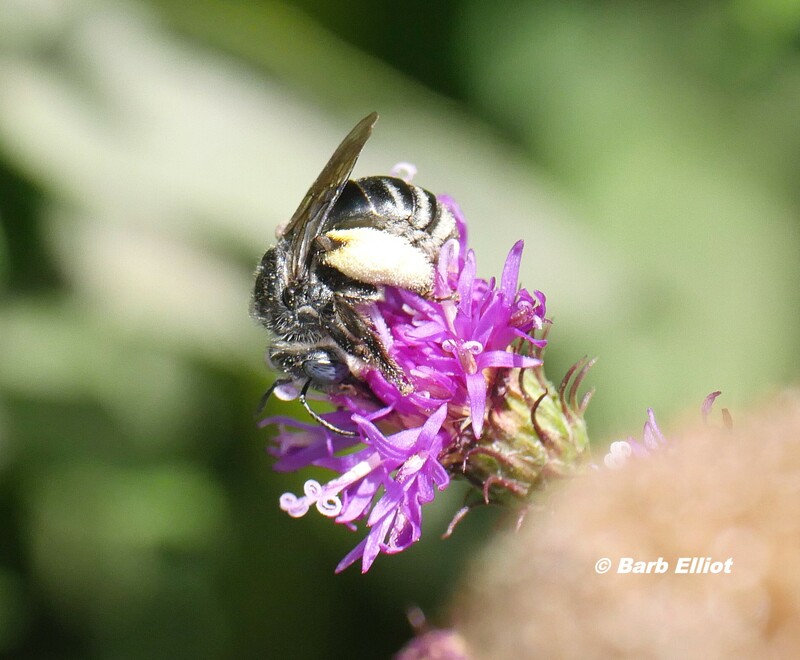 Unknown native bee on Upland Ironweed (Vernonia glauca). © Barb Elliot. Click to enlarge. 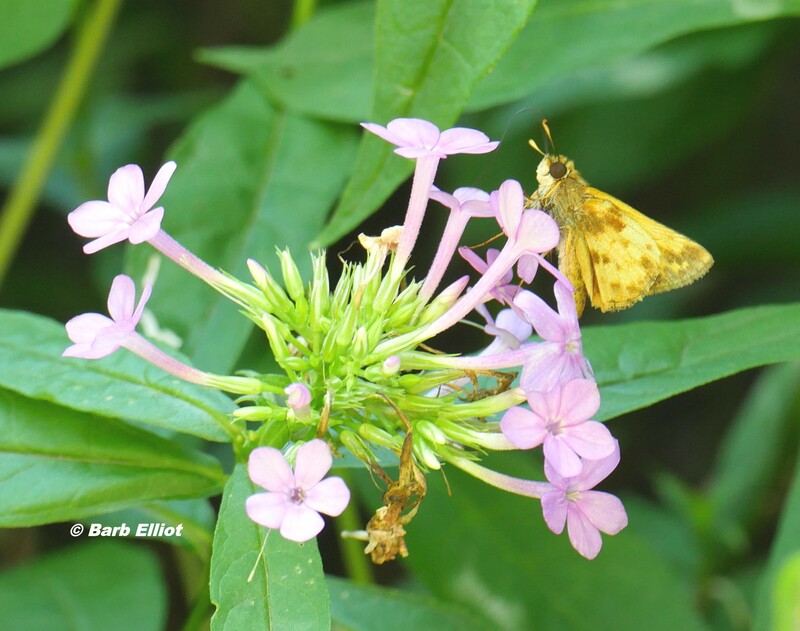 Eastern Tiger Swallowtails and Skippers are frequent visitors at my Garden Phlox. I am happy to find a Monarch, too, but regret that this is the only one I’ve seen in my yard all summer. It’s a female, so hopefully she laid eggs on my milkweed. 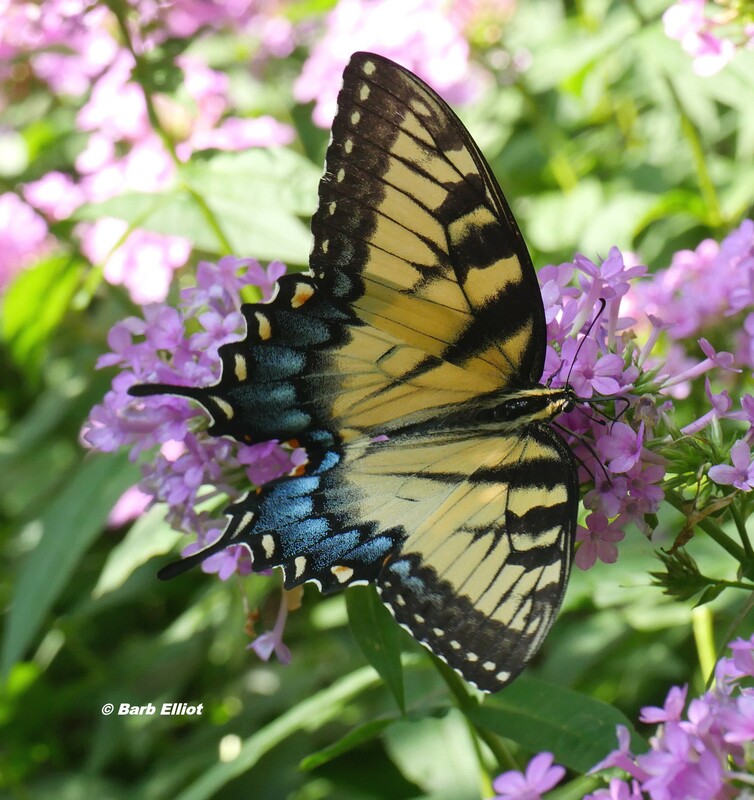 Eastern Tiger Swallowtail (Papilio glaucus) on Garden Phlox (Phlox paniculata ‘Jeana’). © Barb Elliot. Click to enlarge. Skipper (probably Zabulon Skipper – Poanes zabulon) sipping nectar from Garden Phlox (Phlox paniculata ‘Jeana’). © Barb Elliot. Click to enlarge. 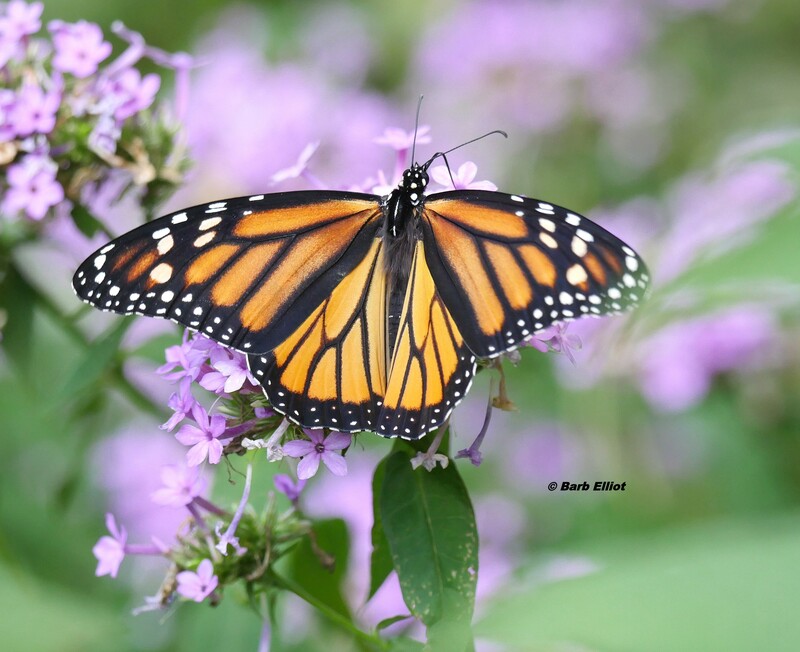 Monarch butterfly (female) on Garden Phlox (Phlox paniculata ‘Jeana’). © Barb Elliot. Click to enlarge. 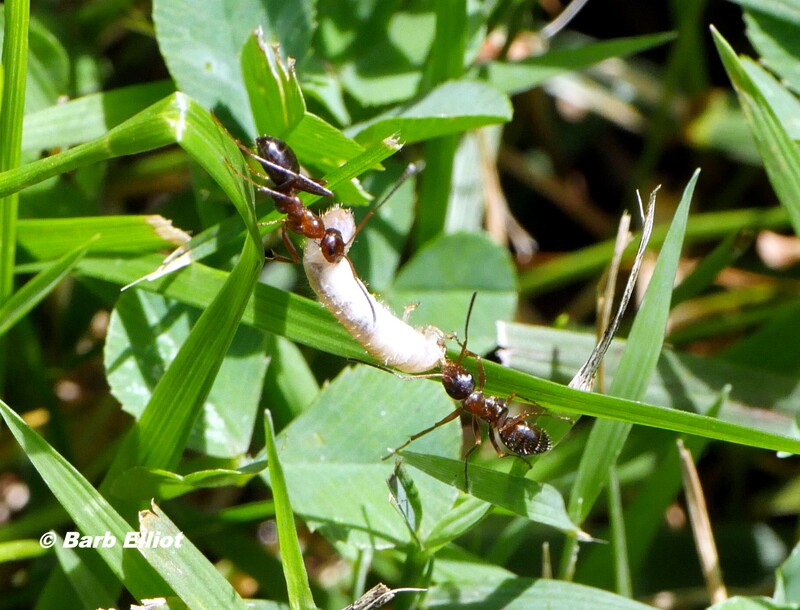 Two ants in the grass struggle to drag a grub to their nest. The grub must weigh many times more than they do. Ants dragging a grub to their nest. © Barb Elliot. Click to enlarge. My Virgin’s Bower vine begins to bloom in late August and hosts a myriad of pollinators twenty-four hours a day. 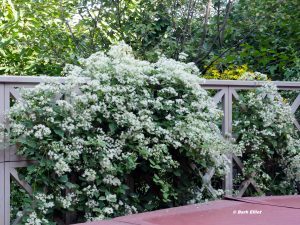 Virgin’s Bower (Clematis virginiana) vine in bloom. 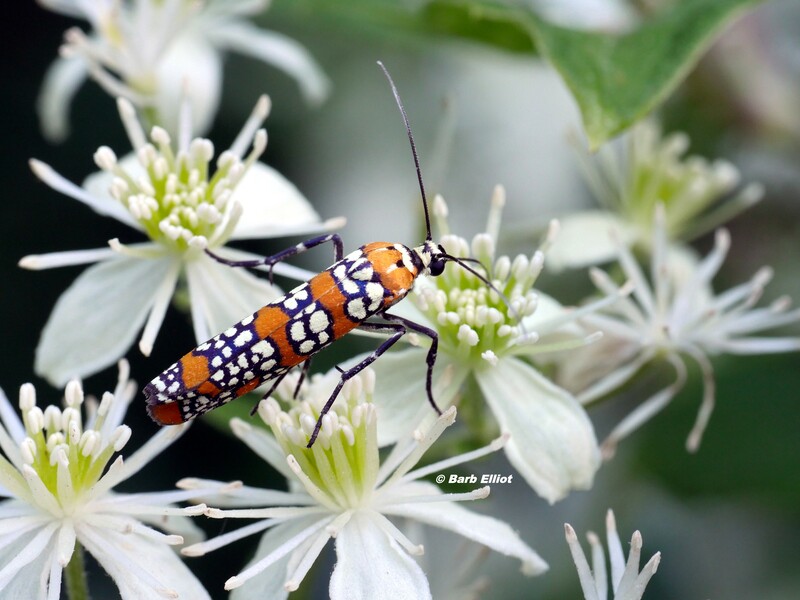 At night, this vine is a moth magnet, attracting beauties like the multi-colored Ailanthus Webworm moth and Tobacco Budworm moth. 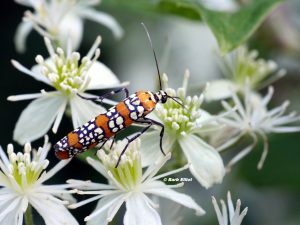 Ailanthus Webworm (Atteva punctella) moth sips nectar at night from Virgin’s Bower (Clematis virginiana). © Barb Elliot. Click to enlarge. Tobacco Budworm (Heliothis virescens) moth sips nectar at night from Virgin’s Bower (Clematis virginiana). Note very small u-shaped caterpillar on flower to the right of the moth’s antennae. © Barb Elliot. Click to enlarge. 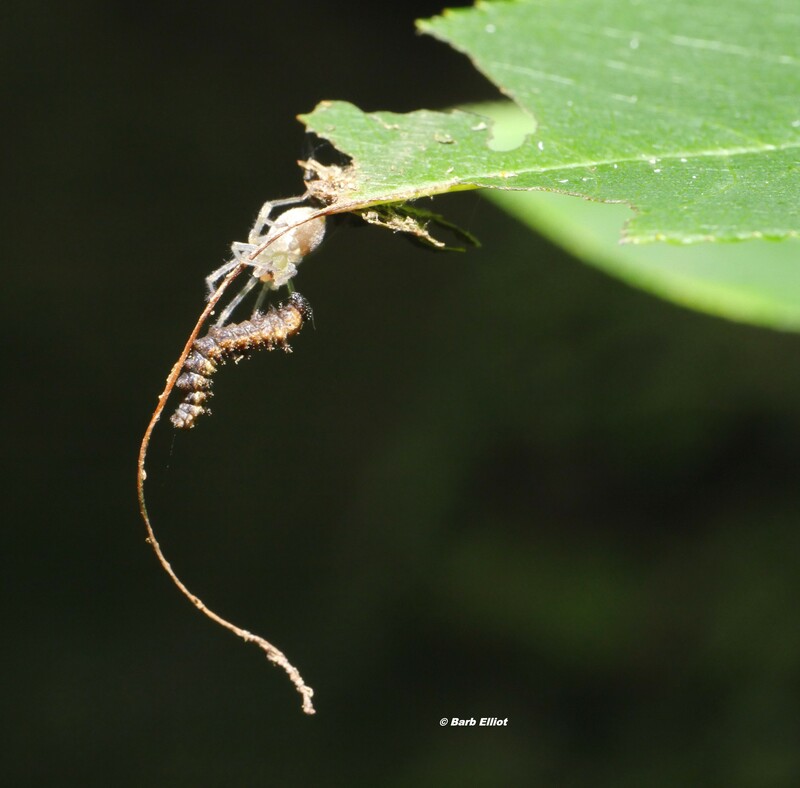 Predators such as harvestmen (“daddy longlegs”) and centipedes linger around the Virgin’s Bower vine to catch unsuspecting victims. 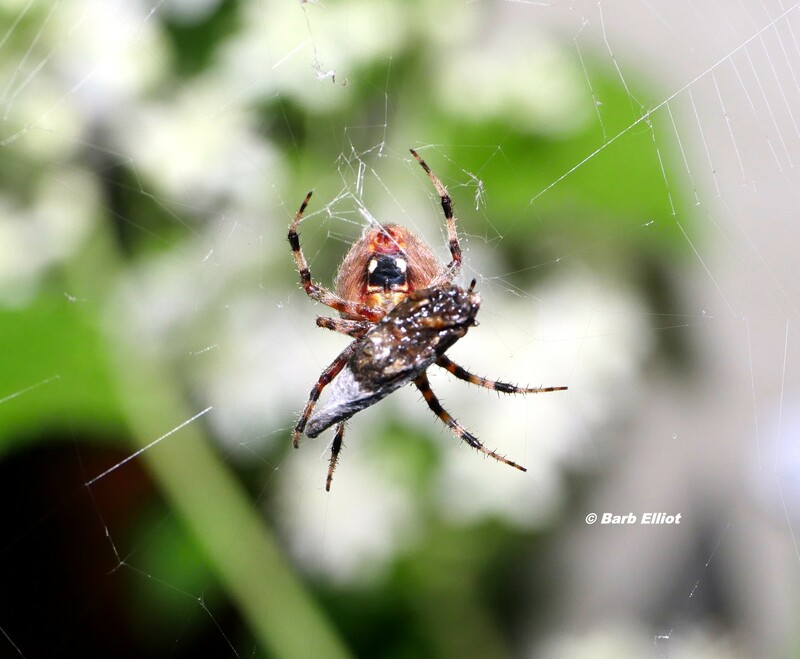 As I watch, a Spotted Orb Weaver spider quickly paralyzes the moth that flies into its web and then wraps it in silk. 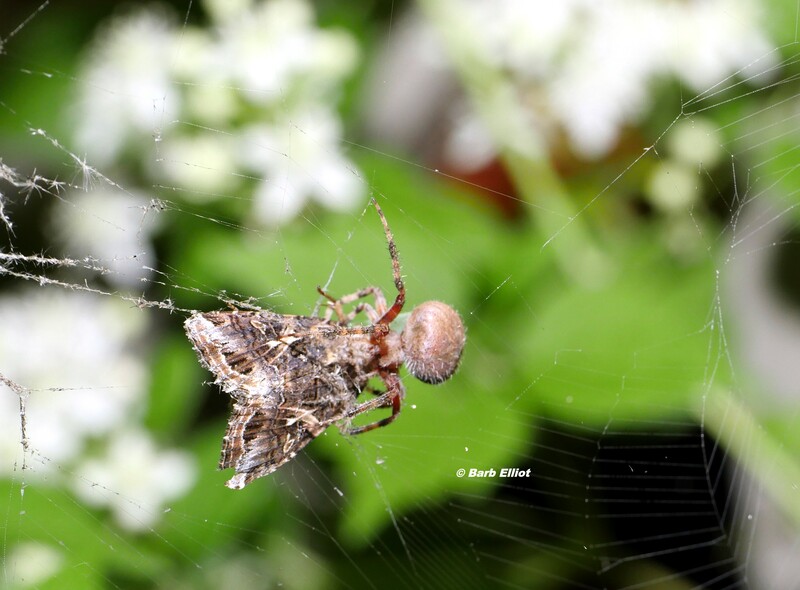 Spotted Orb Weaver (Neoscona crucifera) spider quickly paralyzes a moth that flies into its web. © Barb Elliot. Click to enlarge. Spotted Orb Weaver (Neoscona crucifera) spider with moth wrapped in silk. © Barb Elliot. Click to enlarge. 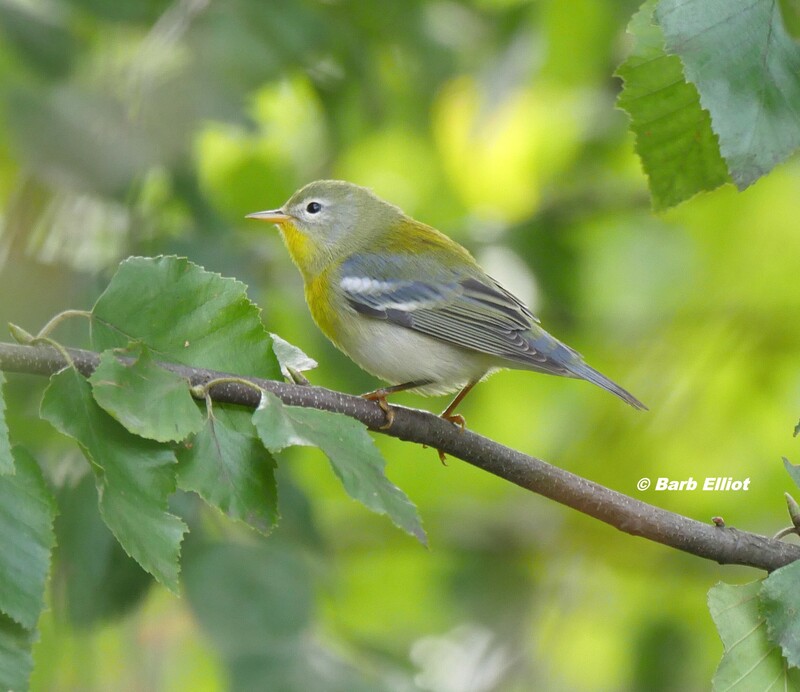 By mid-September, I see some fall migrating birds in the yard, including a Northern Parula and Common Yellowthroat. 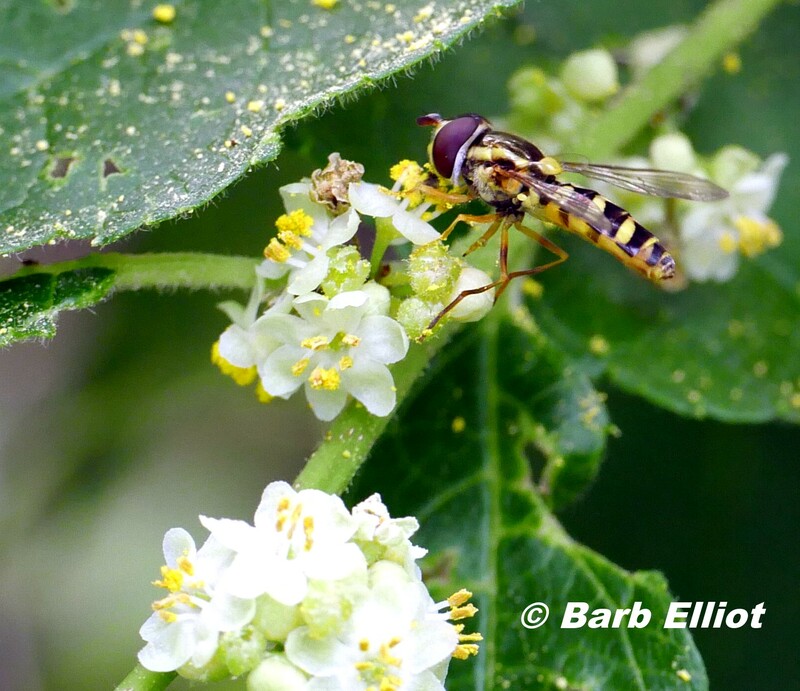 Both find insects on my native plants that will fuel their journeys to the tropics. a migrating Northern Parula (Setophaga Americana) in River Birch (Betula nigra) tree. © Barb Elliot. Click to enlarge. A migrating Common Yellowthroat (Geothlypis trichas) hunts insects by the pond. © Barb Elliot. Click to enlarge. A Red-spotted Purple caterpillar has eaten the tip of a Black Cherry leaf in a pattern characteristic of this species. I watch it grow for almost a week. Then one night I make a gruesome discovery. A spider has found my caterpillar and is in the process of sucking its life fluids. However, I find another small Red-spotted Purple caterpillar a few feet away. I’m hopeful this one will successfully overwinter and make it to adulthood. 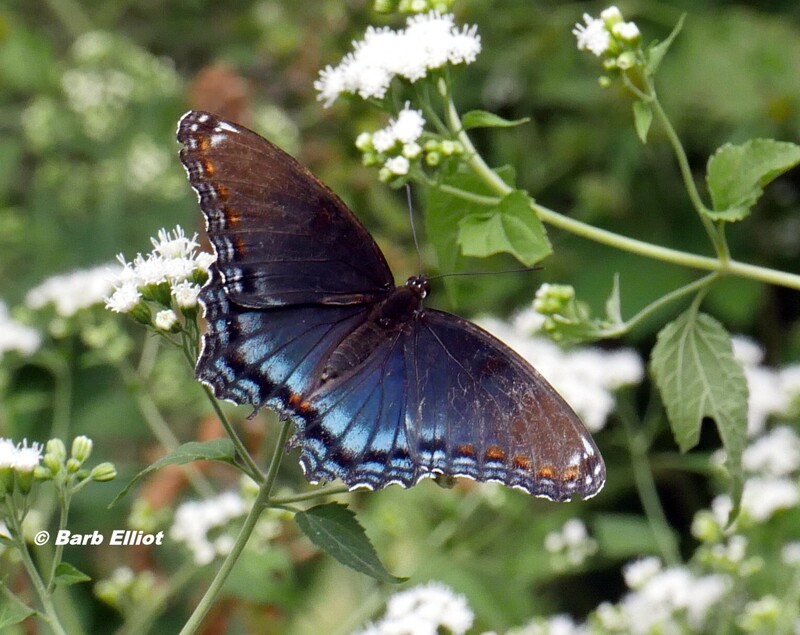 If so, next summer it will grace my yard as another beautiful Red-spotted Purple butterfly. 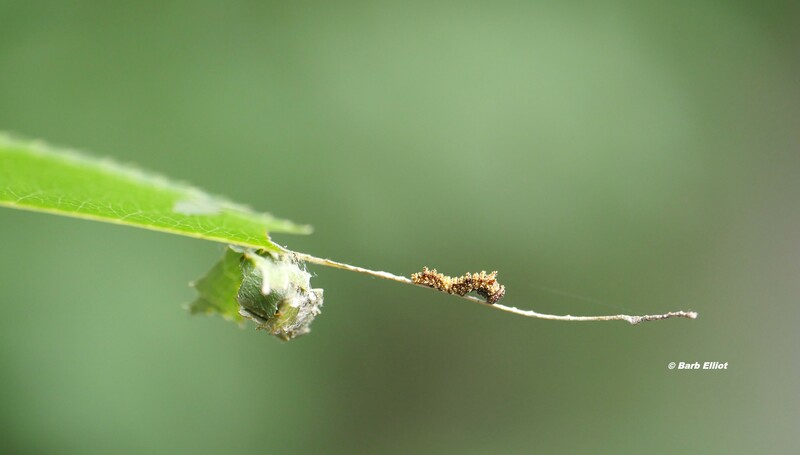 An early instar Red-spotted Purple (Limenitus arthemis) caterpillar on Black Cherry (Prunus serotina) . © Barb Elliot. Click to enlarge. Spider sucking the life fluids of “my” Red-spotted Purple (Limenitus arthemis) caterpillar. © Barb Elliot. Click to enlarge. 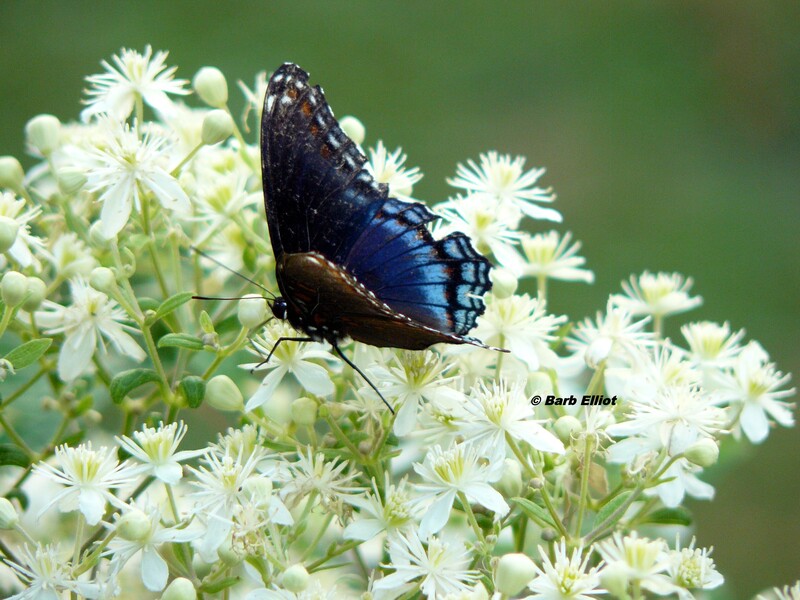 Red-spotted Purple (Limenitus arthemis) butterfly on White Snakeroot (Ageratina altissima) in Barb’s yard. © Barb Elliot. Click to enlarge. I look forward to next summer and discovering nature’s mysteries anew. Evans, Arthur V. Beetles of Eastern North America. Princeton, N.J: Princeton University Press, 2014. Evans, Arthur V. Field Guide to Insects and Spiders of North America. New York, NY: Sterling Publishing Company, Inc., 2008. Switzer, Callin, “Getting Buzzed at the Arnold Arboretum”, Arnoldia; April, 2014. Birds were dropping out of the sky into the trees and shrubs around me. It was daybreak on a fall morning in my backyard. Though I could see only silhouettes, I recognized the chips of robins and Swainson’s Thrushes. In the dim light I couldn’t identify the other numerous birds but knew these were migrants that had flown non-stop from the north during the night. 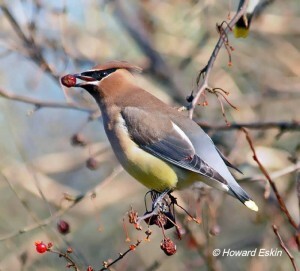 Cedar Waxwing eating Crabapple berries. Courtesy of and © Howard Eskin. Click to enlarge. lots, and sterile lawns, they were desperate for sustenance. From above, the migrants probably see the local parks as deceptively inviting, but the grass and other non-native vegetation provide little nutritious food. Their energy depleted, these migrants need familiar and nourishing native plant food. Otherwise they are in trouble. Watching these migrants, I imagine myself on a road trip, one I’ve done many times. After hours of driving, I’m hungry, tired, and low on gas. I’m looking forward to Rosie’s Restaurant, a favorite stop for good food, gas, and a respite from the journey. To my dismay, the restaurant and adjacent gas station are gone. Wasting time and energy, I must drive around randomly to locate what I need before resuming my trip. Migrants often find my yard and use it to rest and refuel. During fall migration, especially after a cold front, I search for recent arrivals. Sometimes I find thrushes, tanagers, grosbeaks, and warblers eating berries on the Virginia Creeper, Arrowwood Viburnum, Winterberry Holly, Spicebush, Black Chokeberry, Flowering Dogwood, Crabapple, and Northern Bayberry I’ve planted for them. One winter a southbound Hermit Thrush stayed in my yard all winter eating American Holly berries. Cape may Warbler eating Virginia Creeper berries. Courtesy of and © G. Dewaghe. Click to enlarge. hanging above my deck railing. Because the bird is just a few feet away, I don’t really need my binoculars. It lands on a branch, leans forward, grabs one of the blue-black berries, then quickly swallows—again and again, all day long. Either a resident breeder soon to migrate or a recent arrival using my yard as a stopover, this bird needs these berries. 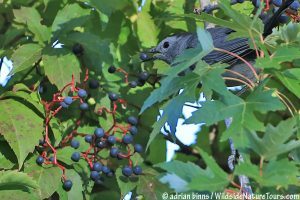 Besides Gray Catbird I’ve seen Red-bellied Woodpecker, Northern Flicker, Brown Thrasher, Cedar Waxwing, Eastern Bluebird, Swainson’s Thrush, American Robin, Cape May Warbler, and Yellow-rumped Warbler eating Virginia Creeper berries. Highly nutritious Arrowwood Viburnum berries were most preferred by migrants preparing for fall migration in the Block Island study. Photo © Edie Parnum. Click to enlarge. that are high in antioxidants and fat prior to migration. Antioxidants help birds(as well as humans) handle stress. Because migration is certainly stressful, birds need to find nutrient-rich berries at stopovers along their migratory routes. Migration is hazardous for birds. On their southward journey they fly at night for four to six hours without a break. They must stop and refuel several times before reaching their wintering grounds, especially if their final destination is the tropics. They spend four to five days at each stopover where most consume nutrient-rich berries. If they fail to find sufficient fuel for the next leg of their journey, they become weak and vulnerable to hawks, owls, and other predators. Scientists tell us even small patches of native plants can provide food and shelter for migrating birds. On my three quarter acre property, I’ve planted scores of fruit-bearing native shrubs, trees, and vines. 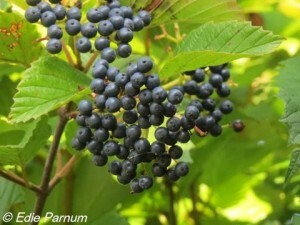 Besides the shrubs mentioned, I’ve recently planted Black Gum, Hackberry, Sassafras, and Spicebush that will offer fruits in future autumns. Also, in a few spots I allow Pokeweed (regrettably considered a weed by most gardeners) to grow and produce beautiful dark purple berries irresistible to birds. Birds do eat non-native berries. 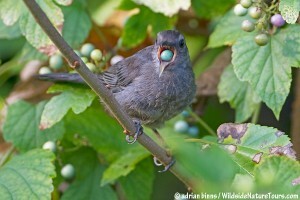 This Gray Catbird is eating invasive Porcelainberry and, regrettably, spreading the seeds. Photo courtesy of and © Adrian Binns/Wildside Nature Tours.com. Click to enlarge. strongly-colored berries, either black or red, or have leaves or stems that are bright red, birds can easily find them. Also, the native berries ripen at the right time. 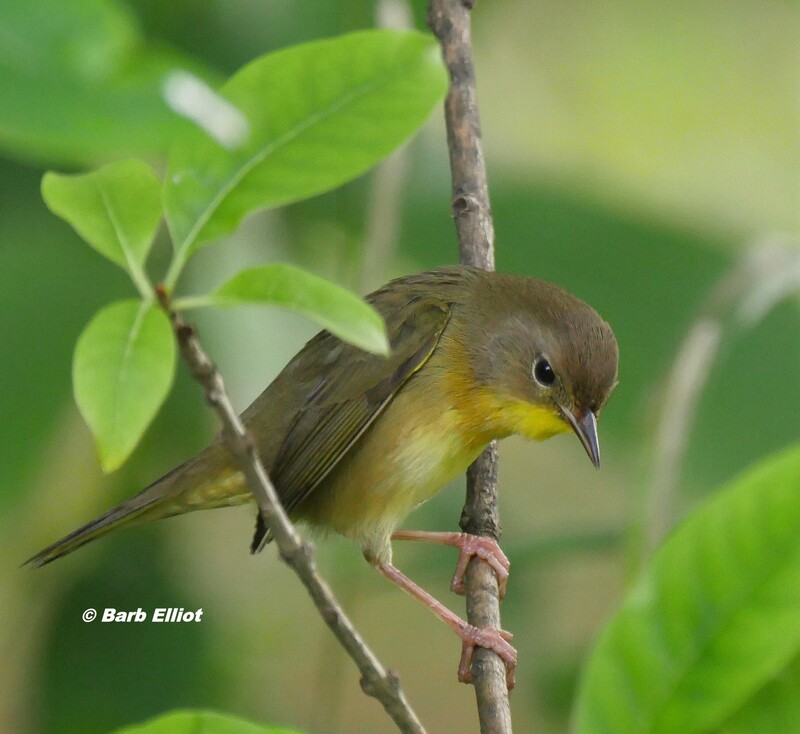 Many migrants, especially warblers, continue to eat insects as well—found primarily on native plants. 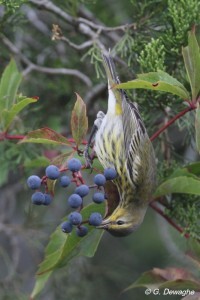 If necessary, of course, birds will also eat the less nutritious fruits of non-native plants. Most yards have room for shrubs. You can plant native fruit-bearing shrubs and small trees around your property’s perimeter to create a hedgerow laden with nutritious fall fruits. You can also group them around isolated trees. By reducing your lawn, you’ll find room for more shrubs and other fruiting plants. Birds, especially those that migrate to the tropics, are in trouble. On average, the populations of long-distance migrant species drop 1% each year. We assume we can do little except give money to organizations that preserve land. However, we can help migrating birds survive their perilous and crucial journeys by growing the plants they need and love.